Released in 1976, this is probably my favourite Sweet album. It was released in 1976 and was the follow up to ‘Give us a wink’ The review is divided into my usual three parts, my initial reaction, what I think of it now and my best attempt at an objective summary. Sweet in the UK in 1976 were all but forgotten. There was, however still an occasional interview in the music press with the band. Normally the undercurrent of these was the band pointing out the much greater success they were having abroad. Perhaps not explicitly, but still clearly they seemed to be saying that the UK was missing out by its lack of interest (true in my opinion) and that the band didn’t care if they were successful in the UK or not. The second sentiment sounded petulant, wasn’t going to help and worse was clearly not true. Don’t forget success as respectable rock stars was very important to them. They all lived here at the time and couldn’t ignore local failure so easily. The main criticism they had endured in the early days had been in the UK, to be ignored must have been even worse. What was needed was something to re-establish the band at home and to enhance their position overseas. This album in many ways could have been the one to do just that. It is far more accessible than any other Sweet release with the possible exception of SFA. It is also a classic. For me Sweet was always about good songs, great vocals, excitement and charisma. OTR has all of this. Charisma is that indefinable something that sets apart good bands even ones that you like a lot, from that special category of ‘the greats’. OTR actually coincided in England with the start of the punk revolution, which I embraced whole heartily. It is a tribute to OTR that for a while it blew punk away, at least in my mind! The album opens with two songs that had been released as singles in the UK. ‘Fever of Love’ and ‘Lost Angels’. Neither made any impact in the UK, but they are very different songs and very different in quality. ‘Fever of Love’ is in many ways a false start to the album. It sounds like the band and/or the record company had come to the view that they needed a hit single. ‘Fever’ sounds like a half hearted attempt at creating an indentikit hit. Don’t get me wrong, it is not that it is awful and had the band been higher in the public eye it would probably have charted. But it is not the quality of previous Sweet singles. ‘Lost Angels’ on the other hand is superb, a failure as a single maybe, but a mind blowing album track. I imagine that a lot of fans are like me and the Sweet track they would name as their favourite would change a little with time, what mood they are in and what they have been listening to lately. Well ‘Lost Angels’ would always be in my top three. It’s lack of success as a single can be put down to a mixture of Sweet having a low profile at the time, it maybe not being quite right for what would have been almost a break through single yet again and to some extent luck. (Remember Funny Funny happened to get picked up by a DJ and took of along with the Sweet from there). Some people have said that the song is very influenced by Queen. I cane see what they mean, but feel that this is wrong. The song in many ways is a logical progression from ‘Action’. In any case whether by conscious or unconscious influence Queen’s vocal sound was similar to Sweet’s. The next track is ‘Midnight to Daylight’ – a good song which keeps things going nicely. But the final track on side one – ‘Windy City is another song in the category of ‘Lost Angels’. The only time I ever saw Sweet (3 piece) was in Nottingham in 1980. It was at a venue called ‘Rock City’. The DJ had a very superior attitude and played rock from his approved list. (do you know the type of DJ who announces with a sneer what requests he is refusing to ply). Not long before Sweet came on he played ‘Windy’, it stood out as a masterpiece. The problem with reviewing this album is that it is easy to run out of superlatives! ‘Live for Today’, ‘She Gimme Lovin’ and ‘Hard Times’ for me are not quite as good as’ Windy City’ or ‘Lost Angels’. That means that they are only somewhere between excellent and outstanding. The two tracks not mentioned so far are both very different – ‘Laura Lee’ and ‘Funk it up’. ‘Laura Lee is my favourite Sweet ballad. Brian’s voice is superb on it. Had one of the others sung it then it wouldn’t have worked half as well. I’ll come back to this issue on reviews of the later albums. ‘Funk it Up’ is just that – funk. It was actually a very minor hit in the US sometime later (I believe) and to be honest it’s not really my thing. Having said that it is a good song. Writing this review, I have made my mind up, this is not just probably, but definitely my favourite Sweet album. Sweet at their best. OTR was a quality album, one that has stood the test of time, but one that never reached the wider audience it deserved. My view was and is that this album is what was needed at the time of ‘Give Us a Wink’. OTR doesn’t set out to out Zep Led Zep or out colour Deep Purple. For me, it is much more mainstream Sweet. Why did OTR sink without trace in the UK? Well quite simply Sweet had dropped off the radar of the music buying public. I still think a successful single on the album might have generated the interest for take off, but that wasn’t to be. Perhaps as well, every band tends to have a shelf life. The music world’s fashions were as always, changing. Perception being everything, were Sweet still relevant? Putting aside my bias as best I can, I believe that the answer is ‘Yes, they could have been’. If you have bothered to read all my other reviews on this page, you will know that I always believed that Sweet needed to continue to give priority to strong singles as advertising vehicles in a similar way to, say, Queen. Using this approach, bands with no more or even less talent such as Rainbow and Status Quo had considerable success at around the same time. 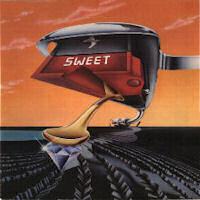 Sweet as part of their drive for respectability went down the road of positioning themselves as a predominantly album band, in the same way that say Deep Purple did. In my view this was their biggest mistake. There is an English saying “I wouldn’t start from here” – what I mean is that the glam image counted strongly against being successful as just an album band, whereas a singles suggest led approach would have pulled the albums along with it. Imagine if you will OTR released in 1974 instead of the UK Desolation Boulevard, but with ‘Fox on the Run’ as a hook for record buyers, or instead of GUAW in 1975, but including ‘Action’ instead of ‘Fever’.. For me OTR or an album like it would have been a success in ’74/’75 – it wasn’t given a fair hearing in 1976. Summing up though, the record is a classic, a must for every Sweet fan and one that has a goldmine of new tracks for newcomers.